The Conservatives have a five-point lead over Labour in the new Number Cruncher Politics voting intention poll. The Tories are on 43 per cent, Labour are on 38, the Liberal Democrats are on 8, while UKIP and the combined Green Parties are each on 3. The SNP have 4 per cent of the Great Britain-wide vote. This represents the widest Conservative lead in any published poll since the general election. We estimate that if repeated in the national popular vote, these numbers would give Theresa May a majority of 10. As outlined yesterday, the poll uses a new methodology to enable it to reach a less politically engaged audience, resulting in a sample whose recalled vote in the 2017 election and EU referendum closely matches both results, with our raw sample remembering voting Conservative by a couple of points in 2017 and voting 52-48 to Leave the EU. It also concurs with academic surveys suggesting that there was no youth turnout surge in 2017, with only 59 per cent of 18-24 year olds saying they voted last June. 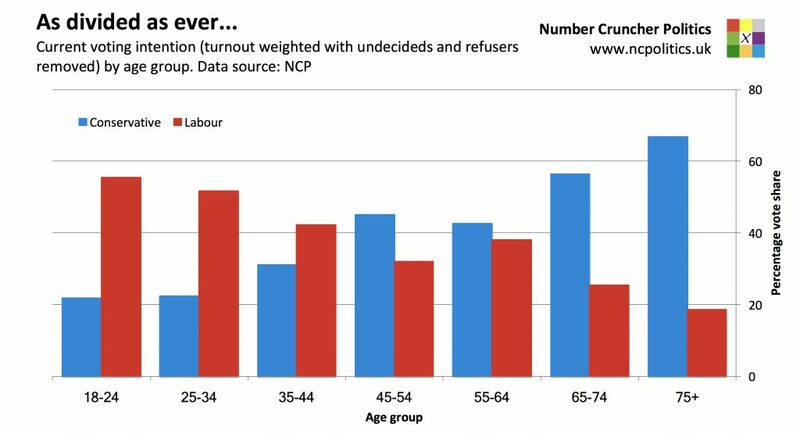 And the generational divide remains substantial, with Jeremy Corbyn’s Labour Party leading by 33 points among 18-24 year olds, while over-65s favour the Tories by 39 points. The increase in the Conservative lead compared with the 2017 result is within the margin of error, and the indicated change is due to the Conservatives appearing to retain slightly more of their 2017 voters, with 84 per cent staying loyal compared with 81 per cent for Labour, though the numbers are close enough that we can’t rule out statistical noise. Only two per cent of each main party’s 2017 voters now they that they would vote for the other. Both main parties have double-digit shares of their 2017 voters saying they don’t know how they would vote in a new election, along with 15 per cent of all voters. Six per cent of respondents refused to answer our voting intention question. Tables are available here, methodology and background to this poll are here, and you can sign up to receive our updates here. Number Cruncher Politics interviewed 1,037 UK eligible voters online between 27th March and 5th April. Data are weighted by age, gender, education and region to match the profile of the eligible voting population. Headline voting intention figures are additionally weighted by likelihood to vote, and are for Great Britain only.